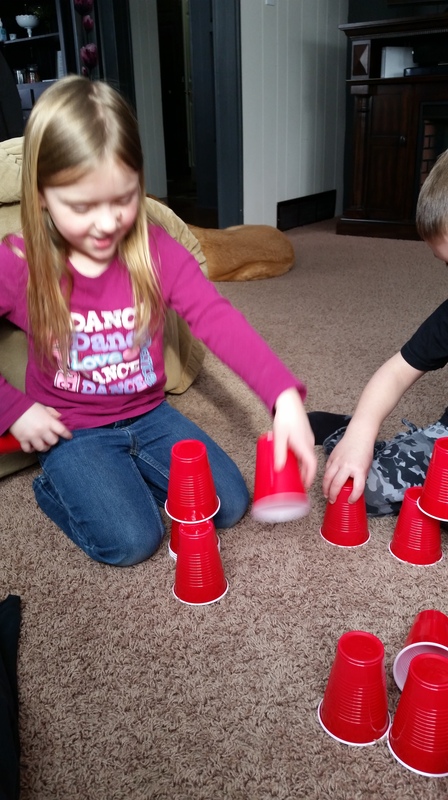 Red cups and lots of fun. 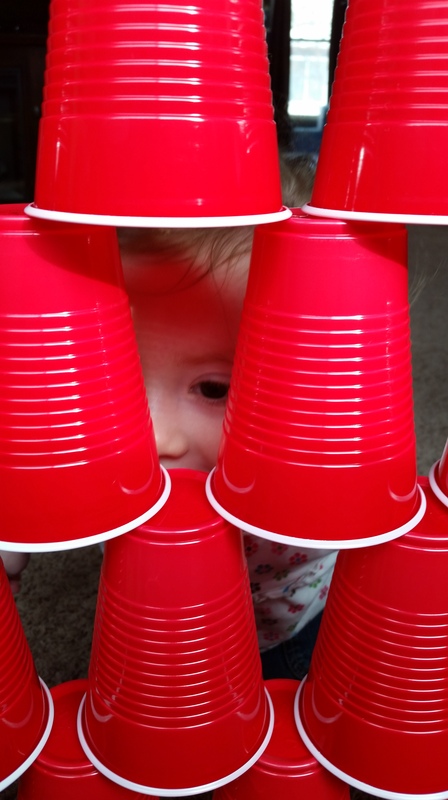 This morning was brought to you by red plastic cups! I set these out for the kids to see what they would come up with. 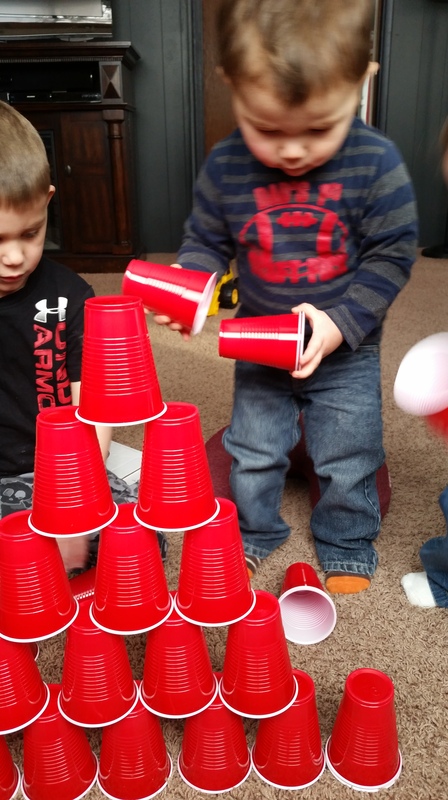 They started by stacking towers, knocking them down with their hands, then their feet, then reinforcements were brought in and they started using monster trucks and dump trucks. That lasted awhile. 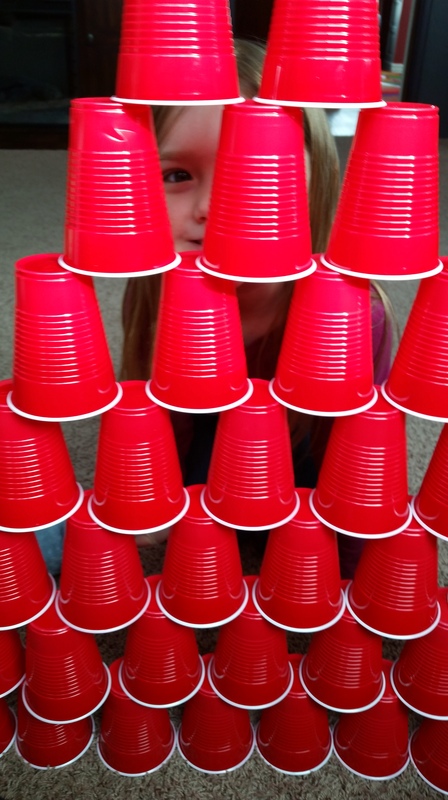 I showed them how they could build a pyramid type tower with them and they thought that was really neat! We seen how tall we could get it, and then one of the little ones would come and knock it down 🙂 At first the older ones were NOT impressed but then started to think it was funny. That continued on for about 20 minutes. 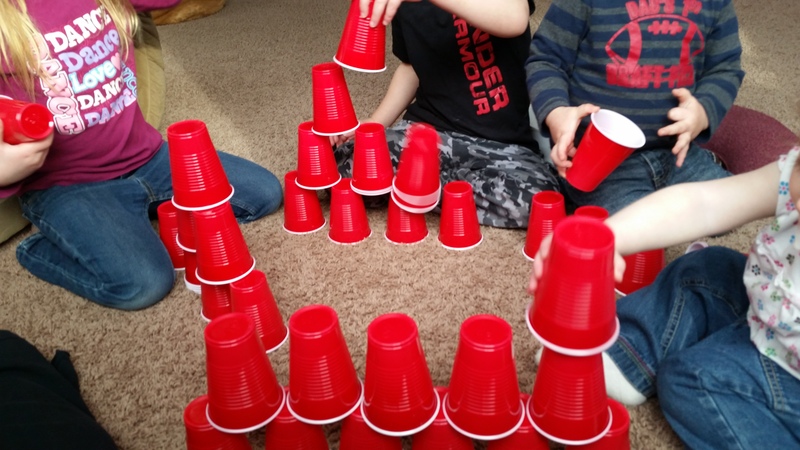 They all eventually grabbed a stack of cups for themselves and started creating, imagining and building things on their own. 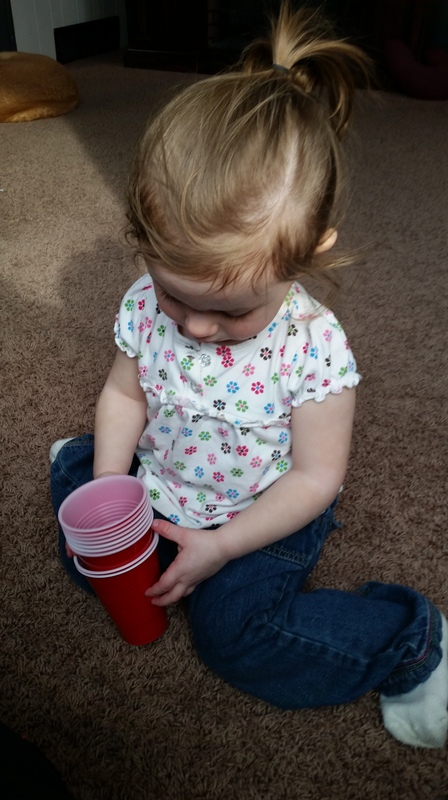 I observed an older child sitting on the couch, stacking the cups together and counting each one as she did. Then the “baby” sat next to her and started saying “one, two, free, two, free, one”. Some of them would make two or three stacks and compare the height of them, others would chuck the cups across the room and run after them as they rolled on the wooden floor 😉 Needless to say these cups provided us LOTS of fun this morning! 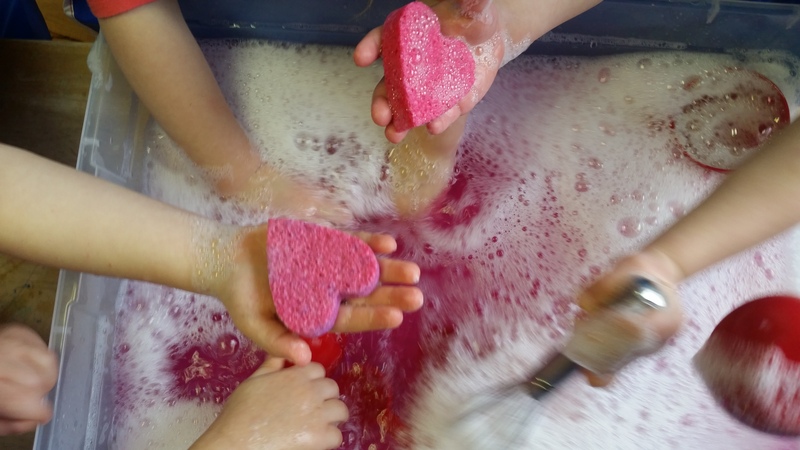 I love when I find an activity that grabs their attention for more than an hour! Oh I almost forgot, the kids all came back together and decided to make a pretend lemonade stand. They served up some delicious strawberry lemonade to all of us 😉 What a great child-led free play LEARNING morning. 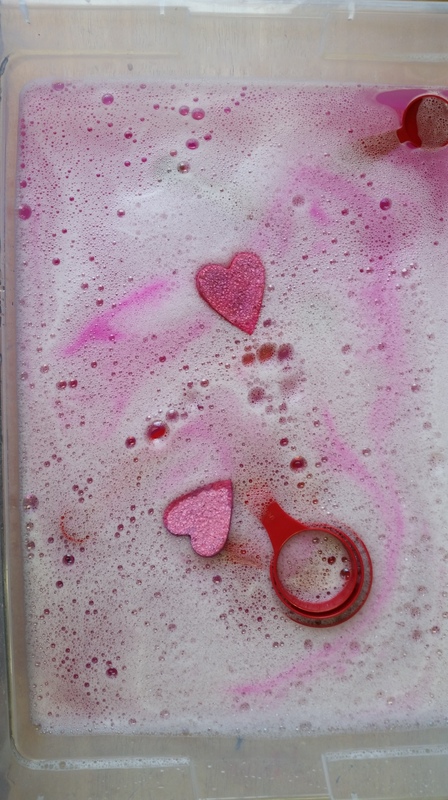 Magenta love bubble water – or just messy fun.